Yomega - Performance driven plastic yo-yo! Collaborations between yo-yo companies have been happening more and more frequently. It is an amazing way to share ideas and come up with cool new products that otherwise may have never even been thought of. The latest collaboration is one that everyone has been waiting for! This is the YoYoJam and Yomega FIRESTORM! When YoYoJam and Yomega teamed up they immediately agreed on what they wanted to do - Create a performance driven plastic yo-yo with an affordable price that was made in the USA - And that is exactly what they did! The initial idea for the Firestorm started with the base design of the popular YoYoJam Classic and as the two companies tweaked and tinkered in a colaborative effort to bring you something incredible the design spiraled into en entirely new monster - The Firestorm. This yo-yo is fast, stable, and spins for days. Each half is created from two pieces of molded celcon plastic to give the Firestorm the perfect weight distribution and a really great feel on the string. 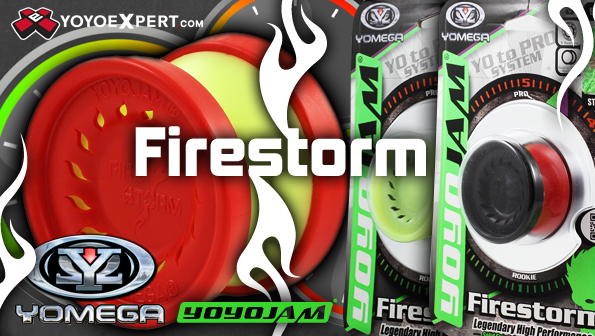 The Firestorm is a fantastic yo-yo that both YoYoJam and Yomega can be proud of. You can see and feel the influences from both companies and once you throw it you will be hooked! The Firestorm comes responsive out of the box but can easily be made unresponsive with an upgraded bearing!